Jon and I just returned from an amazing week in St. Thomas and St. John to celebrate our 5th anniversary just a few months delayed. We ate very well all week, but our favorite restaurant was Havana Blue at the Marriott Morning Star Resort in St. Thomas, a restaurant featuring Latin food. As soon as we walked into the restaurant, we knew it was not run by the Marriott (this is a good thing). While all of the restaurants and facilities at the Marriott featured your typical beachy/resort decor, Havana Blue looked like a big city restaurant that had been placed on the beach. Dark wood, blue lights, lots of candles, loud music, and flowing white chiffon fabric gave the restaurant a trendy yet cozy feel. "So, I’ve mentioned in previous posts some of the fantastic wines we’ve had: Ridge Lytton Springs (especially 2002), Eponymous, Opus One and so on, but on our vacation we had the opportunity to try one that I’ve only rarely seen – Ridge Monte Bello. Now, I’ve seen a few vintages in some of the better wine stores, but have never found this in a restaurant. At Havana Blue, though, on the menu they had a 2004 vintage, which proved to be the perfect complement to this fantastic dinner. 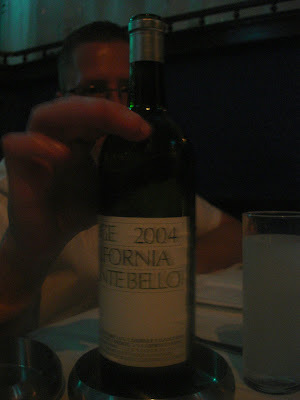 Side note: when I ordered, the sommelier offered that they had a bottle of 2000 vintage available along with the 2004. For some reason, I was suspicious that, being in the Caribbean with the heat, humidity and unreliable utilities, the 2000 may have had a tough time in storage, and ordered the 2004. When the bottle arrived, I declined having it decanted, and instead let the waiter pour a taste. What emerged in my glass was nothing short of the most lush, decadent, sultry and smooth Cabernet Sauvignon blend I’ve ever had. The wine is deep red in color, with a full feel and surprisingly dry finish. This wine, an amazing blend of 76% Cabernet Sauvignon, 13% Merlot, 8% Petit Verdot and 3% Cabernet Franc, easily surpasses anything else we’ve tried to date. If you have the opportunity, save your pennies and treat yourself to a bottle of this for a truly special occasion. If you can find it, you’ll likely shell out in the area of $150.00 for a bottle, but for the right evening in the right company, this wine is certainly worth it." 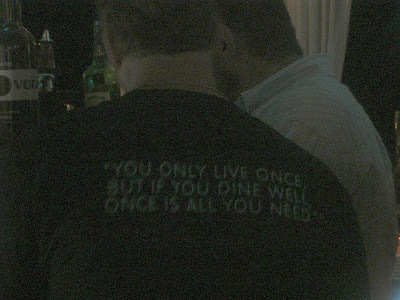 The food at Havana Blue was just as good as our wine. 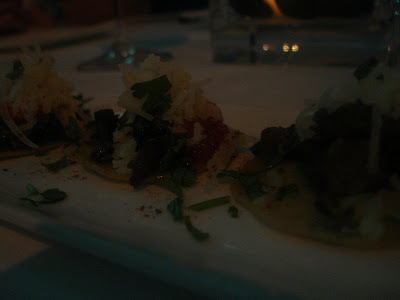 We started with two appetizers - tacos de filet and lobster taquitos. The lobster taquitos featured miniature blue corn hard taco shells stuffed with a nice piece of Caribbean lobster meat, salsa, and cilantro. I don't eat seafood but I ate one of the taquitos. Crunchy with sweet and tender lobster meat topped off with the flavor of cilantro - refreshing and delicious. For entrees, Jon had snapper (we can't remember exactly how it was prepared, we drank too much during the rest of our vacation :) and I had chicken breast stuffed with Manchego cheese, topped with a Cuban red sauce, and served with pigeon peas and rice. I couldn't get enough of this meal and practically had to be rolled out of the restaurant! Everything was so delicious, perfectly seasoned, perfectly prepared, fresh, and featured all of the flavors I love the most. Now it's back to reality...can't wait to plan our next vacation! Congrats on 200! Here's to many more!